Soul. A functional complex in the psyche. (See also Eros, Logos and soul-image.) While Jung often used the word soul in its traditional theological sense, he strictly limited its psychological meaning. 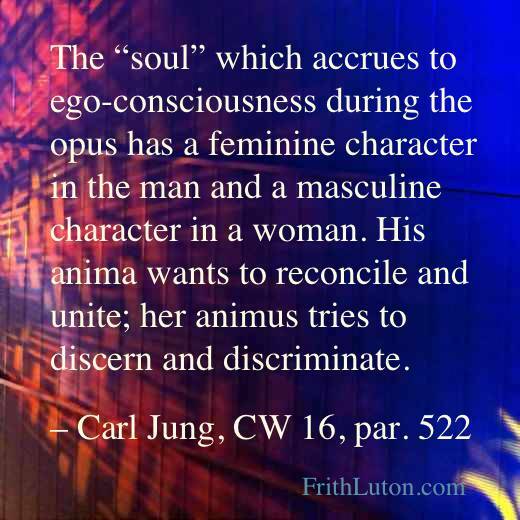 With this understanding, Jung outlined partial manifestations of the soul in terms of anima/animus and persona. In his later writing on the transference, informed by his study of the alchemical opus – which Jung understood as psychologically analogous to the individuation process – he was more specific.